Today I often hear that fresh fruit and vegetables are best – and that canned vegetables aren’t as tasty. This differs from a hundred years ago when canned vegetables were considered a “modern” way of preserving food. 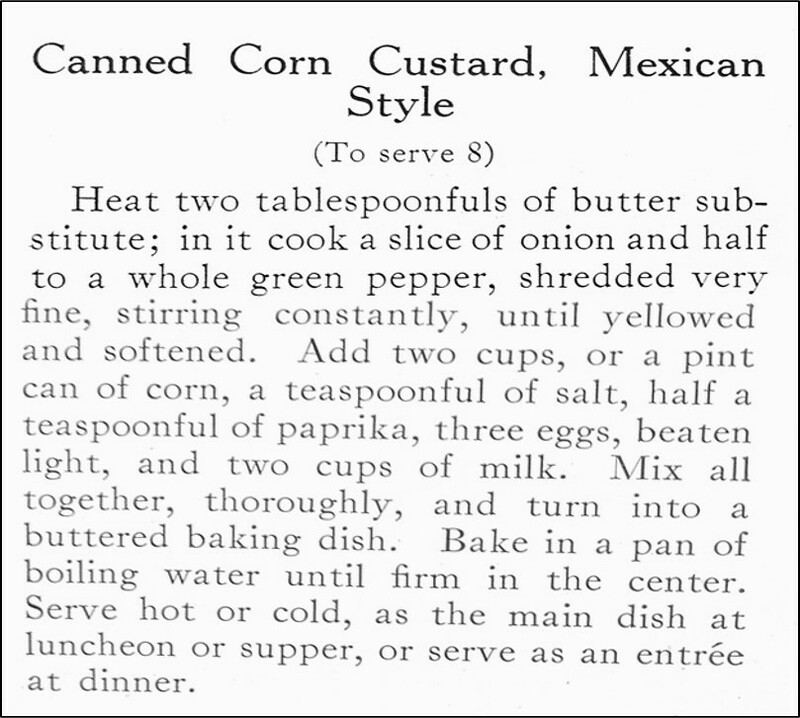 I recently came across a hundred-year-old recipe for Canned Corn Custard, Mexican Style that intrigued me, and – though knowing that canned corn is not trendy – decided to give it a try. 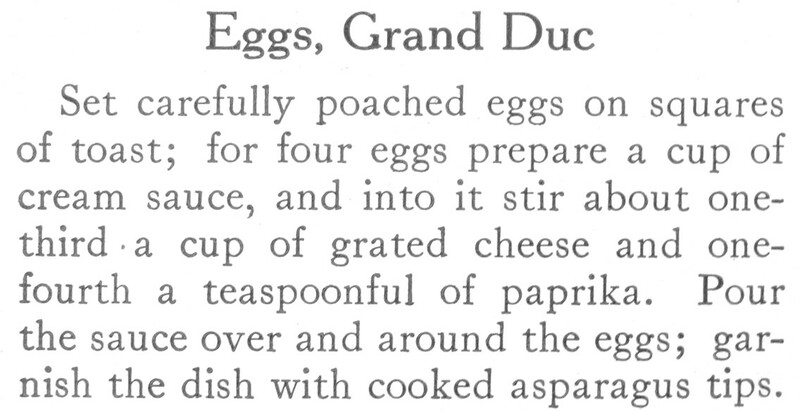 Perhaps part of what intrigued me was the claim that this was an internationally-inspired recipe. Was it really Mexican style? – or did the recipe author just think that a humble dish seemed more enticing if it was billed as an internationally-inspired food? I’m glad that I gave this recipe a chance. 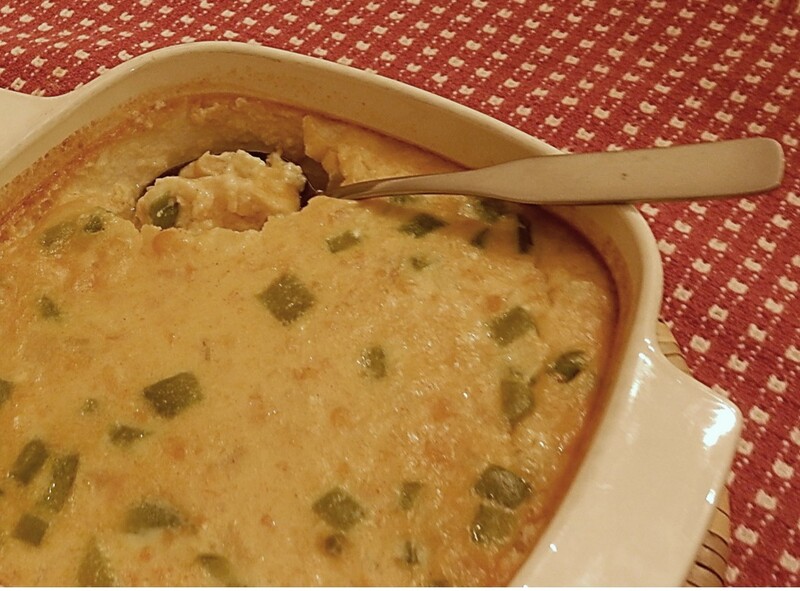 The Corn Custard was rich and silky, and brought back warm, fuzzy memories of family gatherings many years ago when a similar dish was served. 1 pint corn (15-ounce can corn) – I used creamed style corn. Preheat oven to 400° F. Melt butter in a skillet using medium heat. Put chopped onion and green pepper in skillet; saute until tender. In the meantime, in a bowl, stir together eggs, milk, corn, salt, and paprika; pour mixture into the skillet with the onions and green peppers while stirring constantly. Continue stirring until the mixture is hot and steamy. 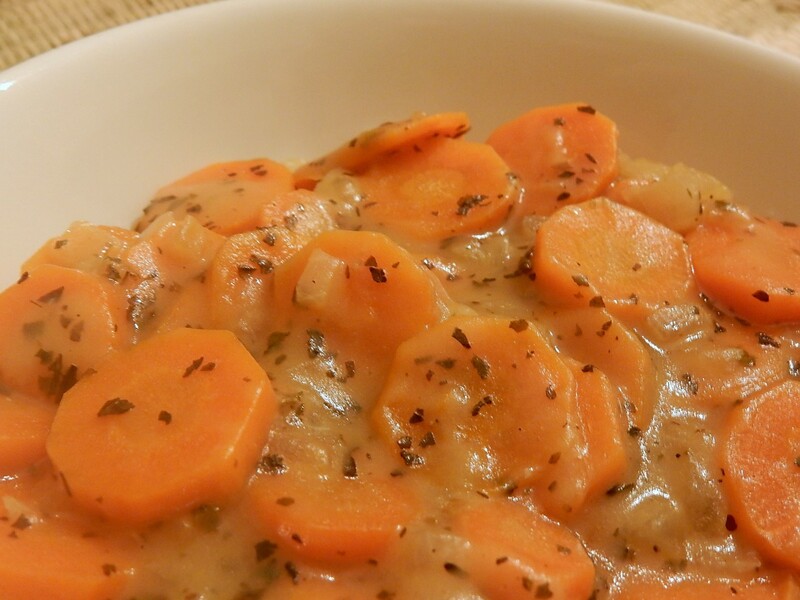 Remove from heat and pour into a well-greased 2-quart casserole dish. 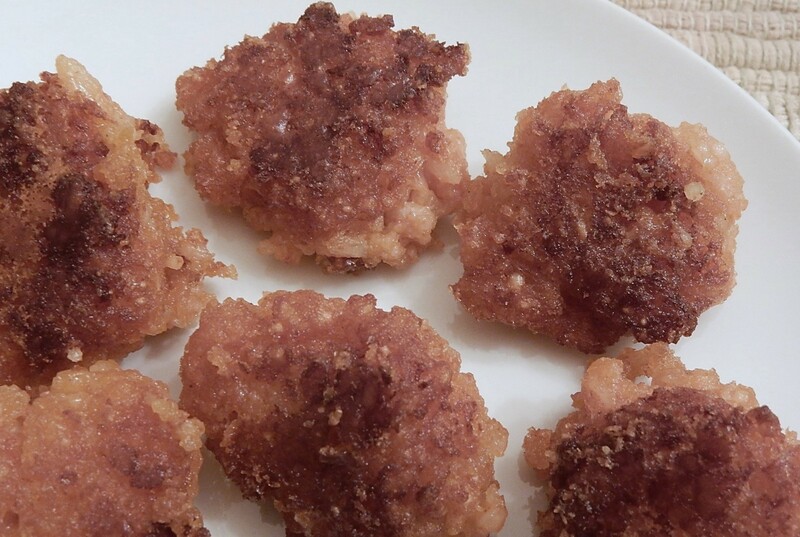 I recently made a hundred-year-old recipe for Graham Pop-overs. The pop-overs did not rise as much as anticipated, but nevertheless they were a delightful bread that seemed more like a muffin than a pop-over. 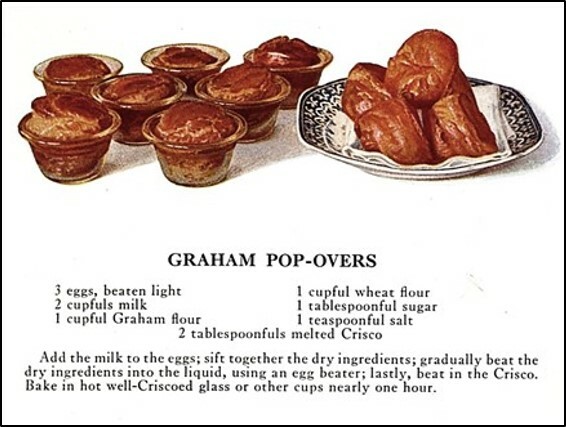 The Graham Pop-overs had a slightly nutty flavor, and were wonderful when served warm with butter or honey. 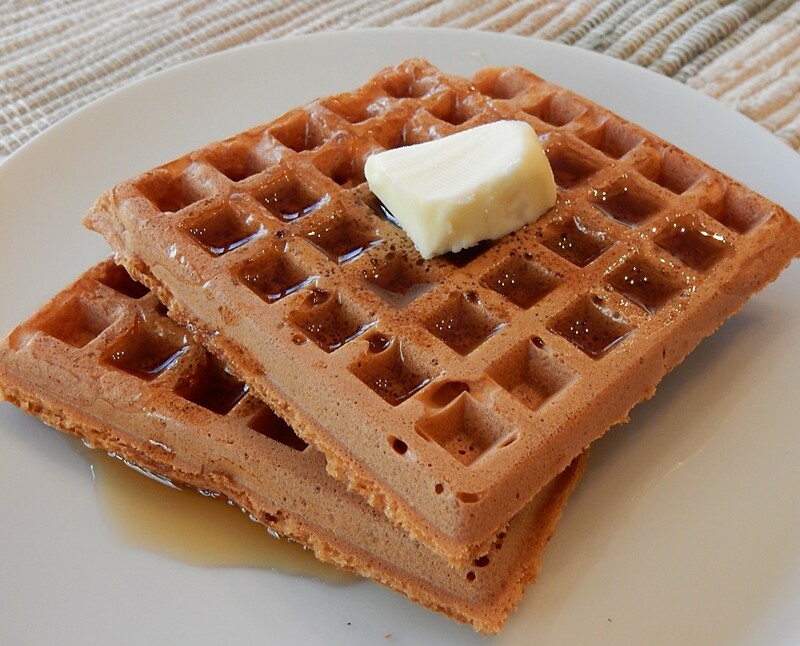 Graham flour is a coarsely ground whole wheat flour that contains the endosperm, the bran, and the wheat germ. Modern graham flours sometimes have most of the wheat germ removed to prolong shelf life and to help keep it from going rancid. Year ago graham flour was considered a health food, and I regularly see recipes that call for it in hundred-year-old cookbooks. Graham flour is named after its inventor Sylvester Graham. He began making graham flour in the 1830s, and promoted it as part of a health movement which encouraged eating vegetarian meals and unseasoned foods. It might take a little effort to find graham flour. I had to look for the flour at three stores before I finally found it. And, here’s the recipe updated for modern cooks. 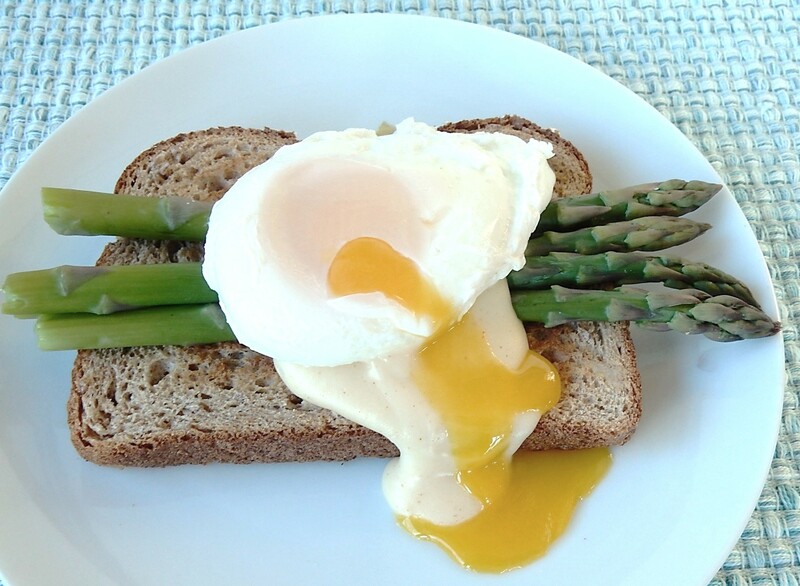 Preheat oven to 450° F. Beat eggs, then add milk. Beat in graham flour, all-purpose flour, sugar, salt, and shortening. Beat until just combined. 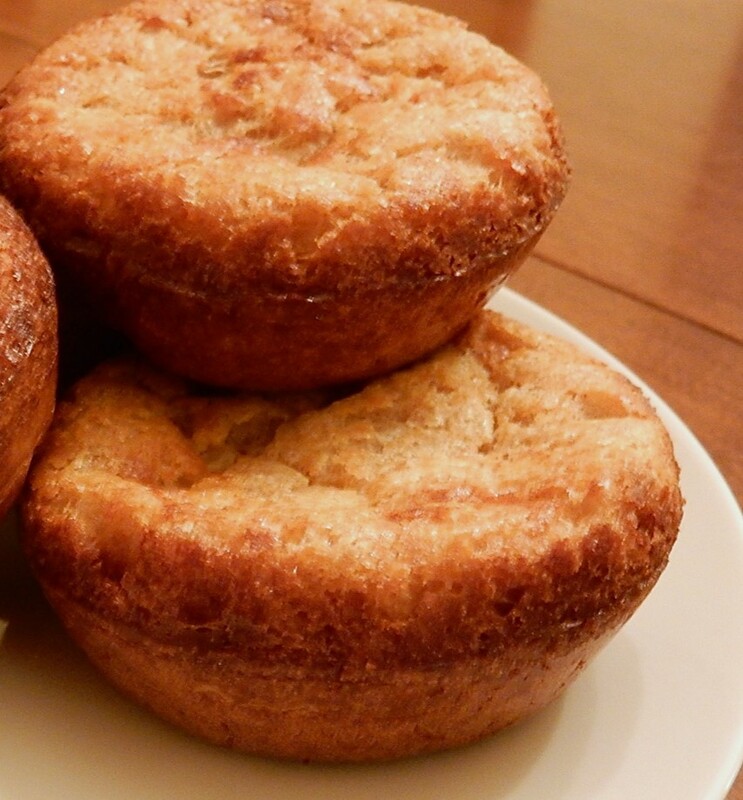 Put batter into well-greased custard cups (ramekins) – or a muffin tin may be used. Fill each cup 1/2 full. Place in the oven and bake for 25 minutes. Do not open oven to help ensure the pop-overs rise completely. Reduce heat to 350° F. (The oven may now be opened to test for doneness.) Bake another 5 – 10 minutes or until the pop-overs are lightly browned and spring back when lightly touched. Remove from oven and immediately remove from custard cups/muffin tin. The pop-overs baked more quickly than indicated in the original recipe, so I reduced the baking time. The 18th amendment to the U.S. Constitution prohibited the sale of intoxicating liquors. It was ratified on January 16, 1919, and prohibition went into effect a year later. The hundredth anniversary of this event is a good time to take a look at recipes for alcoholic beverages from the 1910s. Bathtub gin, speakeasies, and flappers would be on the scene soon, but in 1919 people were celebrating the move toward temperance. At the time when the 18th Amendment was ratified, it was widely supported throughout much of the U.S. This amendment was the culmination of many temperance efforts by individuals and organization during the preceding decades. 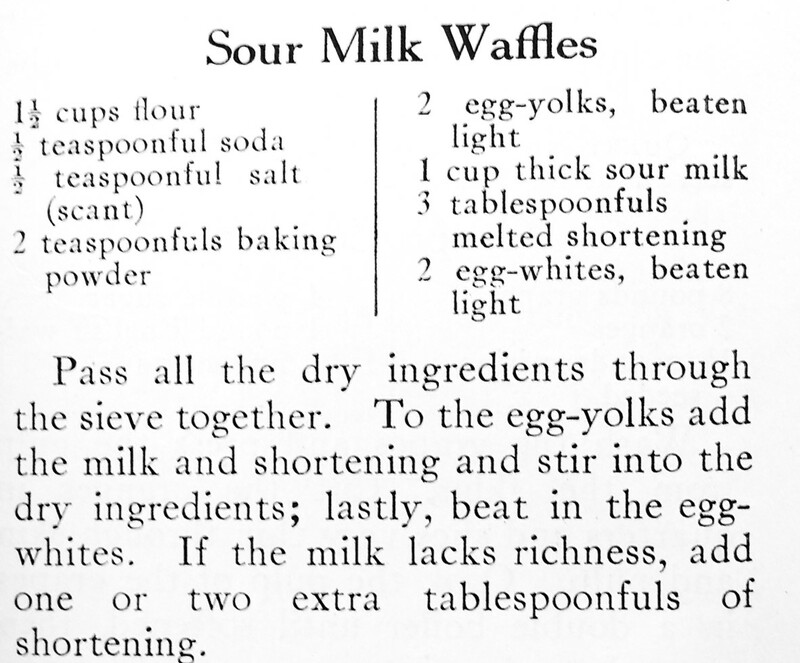 Cookbooks published during the 1910s mirrored the trends of the times – and most contained no recipes for alcoholic beverages with the occasional exception of a recipe or two for egg nog for invalids – cooking for invalids was a common topic in cookbooks of that era – that called for adding a couple of tablespoons of whiskey or other liquor. 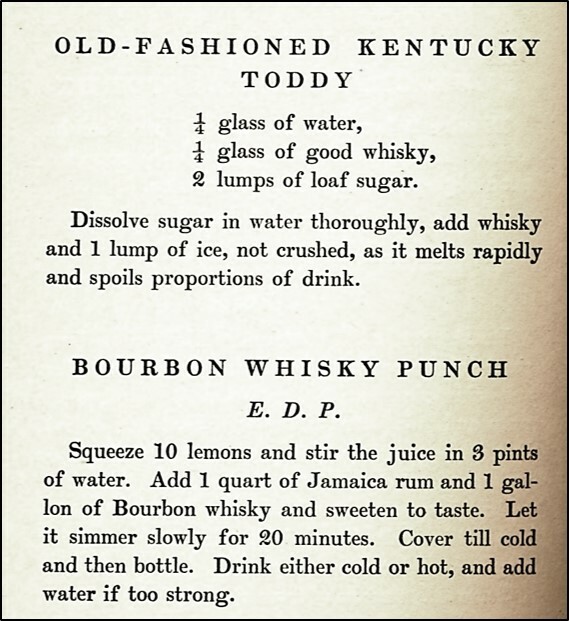 The one cookbook that I’ve found that contains numerous recipes for alcoholic beverages is a 1917 edition of a Kentucky cookbook called The Blue Grass Cook Book by Minnie C. Fox. The two recipes included in this post are from that cookbook.